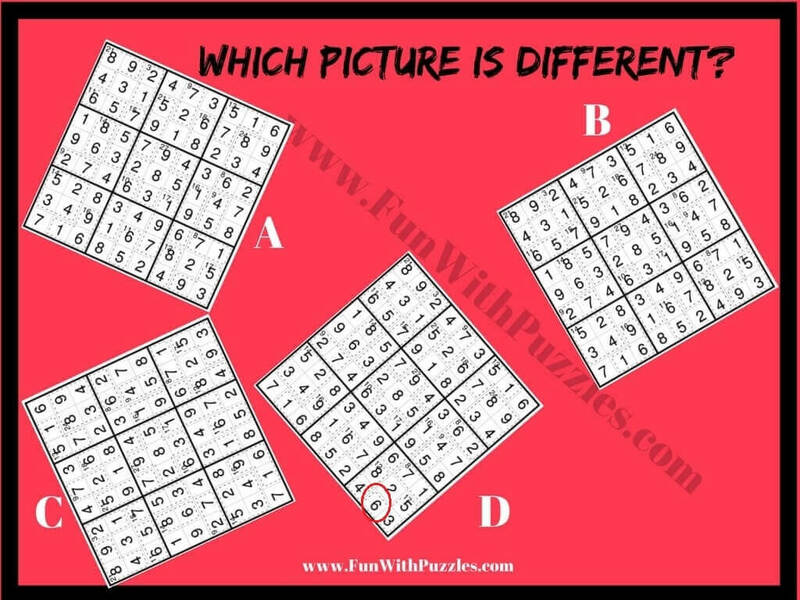 Odd One Out Picture Puzzles are very cool, interesting and sometimes mind twisting puzzles. There are many different types of Odd One Out Puzzles on this website. Here is one of the similar puzzle in which has to find the Odd One Out Picture among the given picture images. Picture Image used here is of Killer Sudoku puzzle type. In this puzzle four picture images of solved Killer Sudoku puzzle are given. These picture looks very similar to each other, but three picture are exactly same and one picture is different from other three picture. Your challenge is find this picture image which is different from other three pictures. 1. Find which Killer Sudoku is different from others? Try to see if rules of Killer Sudoku are being violated in one of the Killer Sudoku Puzzle image. 1. Picture Puzzles with Answers: Here you can find many different types of Picture Puzzles which also includes Odd One Out Picture Puzzles. 2. Picture Riddles to Find The Mistakes: In these picture puzzles your challenge is find the mistake in the given picture images. 3. Fun Picture Puzzles to Test Your Observation Skills: It contains the picture puzzles to test your observational skills. In these puzzles your task is to find the hidden animals in the given photo puzzle images.